This morning we headed northeast where we left humpback whale Patches yesterday afternoon. No whales were to be found in the area so we turned to look in a different location when we heard about a couple humpback on the northwest corner of Stellwagen Bank. These weren’t just any two humpbacks, one of them was Salt! 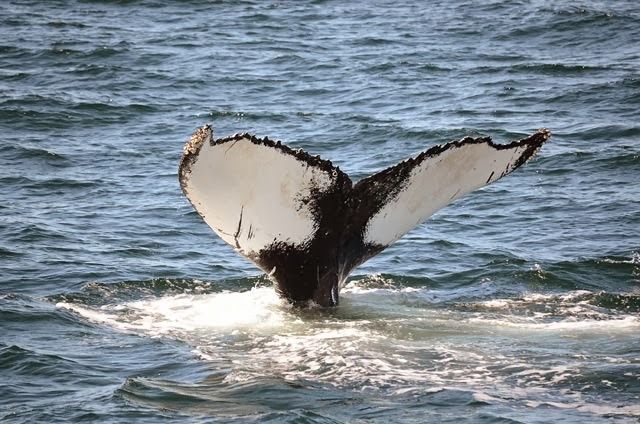 She is the first humpback named and very well known in this area. She was first seen in the mid 1970’s and is commonly found in this area – she’s been known as the ‘Grande Dame’ of Stellwagen. I have not seen her once this year so it was a very special trip! Salt was deep feeding with a whale named Wizard, who was seen several times this season but not with Salt. It was a great trip! We went back out to the northwest corner for one of the afternoon trips in hopes that Salt and Wizard would still be there and they were! We got to spend a lot of quality time with them, even though their dive times were a bit longer this afternoon and were averaging about 6-8 minutes in length. Wizard was also diving pretty shallow and reluctant to show the fluke, but we did get one real nice look at it. Hoping Salt sticks around, we’ve missed her this summer!